"The author of Between Shades of Gray returns to WWII in this epic novel that shines a light on one of the war's most devastating—yet unknown—tragedies. In a time of war, Fate is a main concern; the fate of a country, the fate of loved ones, and the fate of one’s own. As the fates of several people collide, will they trust each other enough to transform their fear of fate into faith? Salt to the Sea is a beautifully written historical fiction that takes place during the second World War and follows the lives of several people from different backgrounds, as they look for peace and respite during a time of life or death. On a journey to a ship that will hopefully lead them towards safety and a better life, we travel with them and discover their shames, grieve in tragedies and relish in triumph. 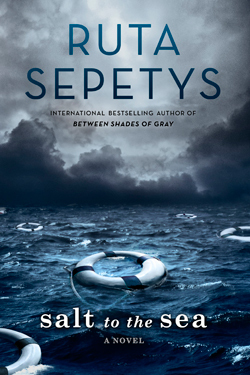 In a mix of Titanic meets The Book Thief, Sepetys weaves us through a dark and unmentionable time in history in the convergence of four point of views. I found Joanna, Florian, Emilia and Alfred’s stories completely moving (whether in love or hate) and I’ve learned some new things about the war. I’ve always felt that a good historical fiction piece should teach you along the way. I absolutely love Ruta Sepetys’ writing and was overjoyed to see that with Salt to the Sea, she did not disappoint. I've had an ARC of this sitting around!! I'm glad you enjoyed it - I will definitely check it out!